An English Homestead: Three Keep Me On My Toes! 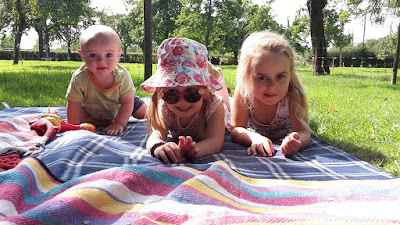 I spent the first day having a picnic with my mum and second preserving with a friend, all whilst spending lots of time with these three trouble makers! The running about starts next week with my eldest starting school and I've already had phone calls from three different friends saying they'll look after the kids if I'll come and do jobs for them - looks like I'm going to be pretty busy! Childcare exchange for carpentry skills, how great is that! Bartering and labour exchanges are always good. You have three gorgeous children Kev, the girls are beautiful and as for your boy, he's so chunky and chubby, he's gorgeous! We have a two week old grandson who was 9lbs 13ozs born, and he's quite chunky too, I just want to chew on his little chubby legs!!! I love a barter, using your skills to help another, my skills are with my sewing machine. You have a beautiful family and both you and you wife should feel really proud. It's terribly busy for you now, but it's the BEST kind of busy! Have fun! A simply joy-filled picture. I have a feeling your son is going to grow up fast trying to keep up with his big sisters. And by the picture, he looks like he's ready!! We do Grandparent duties for one grandson... soon we'll be doing it for two.